Put on your dancing shoes and get ready for some iconic rock 'n' roll in Elvis Slots! Join the King himself and enjoy the music as you win great prizes, enjoy FREE spins and more! 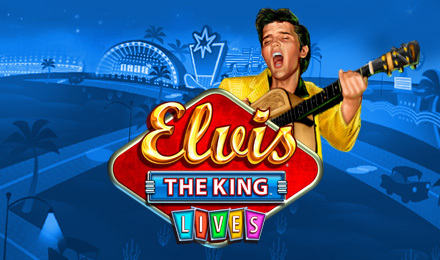 The King is back in Elvis Slots at Moon Games! Get ready to rock 'n' roll and best of all win big! There are 5 reels, 25 paylines, 3 bonus rounds, multiplied wins and more! The game is filled with Elvis imagery, and accompanied with some famous Elvis tunes to keep you having fun and entertained as you spin to win! You can visit the well known Heartbreak Hotel to grab great prizes and big wins, and the game is also packed with FREE spins! You're guaranteed a good time when you play Elvis Slots – what more could you want…big spins and the King himself! Good luck!